It is hard to believe that it is almost 100 years since the start of the Great War. When we view history in hind sight it is with they eyes of a 21st century mind. Back in the early 1900s Germany was already gearing up for war and had quite an extensive narrow gauge railway system developed and stockpiled for deployment, one that could be constructed quickly from pre made sections and transport the munitions and equipment they would need to supply a vast army in the field. 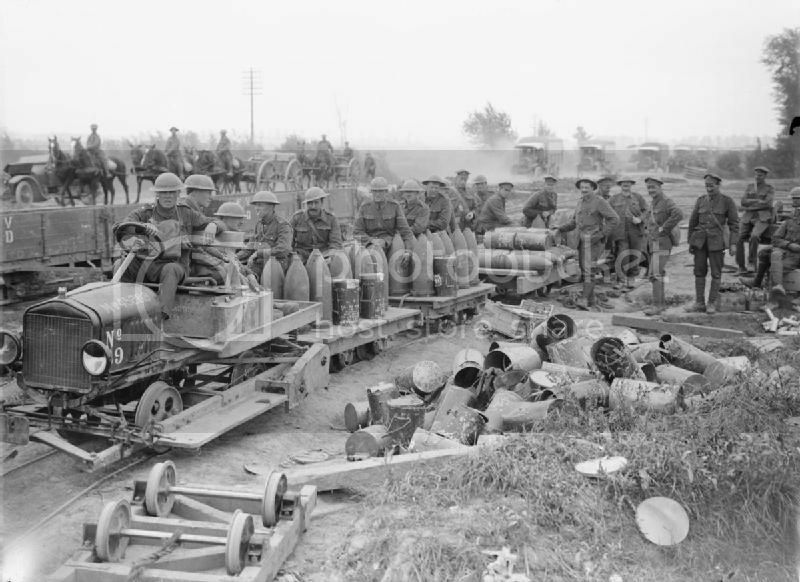 The French too were well developed with their narrow gauge system as a means of supplying their fortifications in anticipation of war and could transport it via the standard gauge to where they needed to deploy. Britain on the other hand looked to the new form of mechanical transport although in reality that was too advanced an idea to cope with the needs of the time. Roads as we think of them were in most cases just dirt tracks and not really suited to the new heave vehicles. The vehicles them selves could be unreliable and broke down frequently. The needs of an army in the field are vast and the British had to quickly adapt to the reality of the situation, utilising existing French narrow gauge where possible and improvising with ad hoc systems cobbled together to cope. Whilst specialised narrow gauge trains and wagons existed one interim measure was to adapt anything that was to hand and so we see the use of the Model T Ford converted for use on narrow gauge rail as one means of filling this gap. Horses were also used to pull loads on rail. The Resicast Ford Draisine kit has been available for many years and depicts one of these ad hoc conversions that proved so vital in the supply of munitions and the materials of war to the front line and could also be used to evacuate casualties to the rear for medical aid. These vehicles were considered tractors rather than trains. The kit comes packed in a sturdy box with a cover label showing the product and manufacturers detail and a colour picture of the finished and painted kit . The kit consists of an instruction booklet, the Ford Draisine tractor and 3 wagons complete with loads plus2 sections of track to mount the kit on. The kit parts are cast in a light grey resin and come in 12 separate ziploc plastic bags with a further two bags containing some plastic rod and some neat headlights and reflectors. Every thing was nicely wrapped in bubble wrap to avoid damage in transportation. The Instructions are in the old style and could probably do with being up dated for clarity. The front page lists the kit parts and these match up against the part numbers on the pours. One thing I have always liked about the Resicast instructions is that they tell you what the part actually is so your knowledge and understanding of the kit is more complete. Page two list 5 steps toward assembly with the 6th step giving some suggested colour schemes for the vehicle. Pages 3 to 7 show the kit in black and white picture format with the part numbers indicated in small writing which for my eyes is hard to read. That said the pictures are fairly sharp so with the written instructions on page 2 and the photographs a successful build should be achieved. The remaining page of the instructions shows 3 completed models of the Resicast Model T Ford: the Ambulance version, The Model T Ford Light Reconnaissance Car and the Draisine kit. Inside the box you get the Ford T Draisine which is a very nicely detailed kit of the converted Ford T. It looks to be very accurate compared to the reference pictures I have of it in use. There are 4 build steps detailed in the written part of the instructions so read these carefully and then use the pictures to help construct the main body and chassis. The build looks reasonable straightforward and the parts are expertly cast. You also get 3 flat bed wagons to attach to the tractor and step 5 in the written instructions covers the assembly of these aided by the build pictures on page 7. Again these look to be a fairly straight forward build. To load onto the wagons or place beside the rails you get two bags of stowage items consisting of a good selection of wooden boxes/creates and shells. Finally to set the whole build off you get two sections of narrow gauge track. The longer section of track measures just over 8 ¼ inches and the shorter section just under 5 ¼ inches. The track sits on sleepers on top of a raise pile of small stones. The tracks are well detailed with appropriate bolts/brackets etc. Edge to edge the track measures approximately 22mm which according to my 1/35 scale rule is about 2ft 3in which is slightly wider than the 24 inches of the narrow gauge railways (60cm). This a really interesting and detailed little kit that should allow for a very unusual stand alone build or a fine addition to a diorama. Detail on the parts is terrific, you get a good number of wagons to fill up as you want and some excellent stowage. This is not a kit for beginners, there are a lot of small parts and the build will require a decent level of patience and skill. The detail and casting looks excellent. The instructions are a bit dated but should be adequate to complete the build. The two track sections appear to mate up well and I’m not sure that 2 inches in track width would be that noticeable in 1.35 scale although for the purists this might cause a sleepless night. The Ford Draisine is fairly well documented and there are a number of excellent photographic reference around. This is a kit that will take you back into a different world, a time of significant change, innovation and development. To a war that was fought to end all wars which unfortunately wasn't the case. A very useful site on the Great War is the Western Front Association and you can access it here.